Any deal would be good, but the agreement being cooked up by Greece and its creditors in the EU and IMF looks decidedly unappetising. Athens’ government may introduce growth-slowing tax rises. More substantial reforms remain far distant. The crisis is far from over. 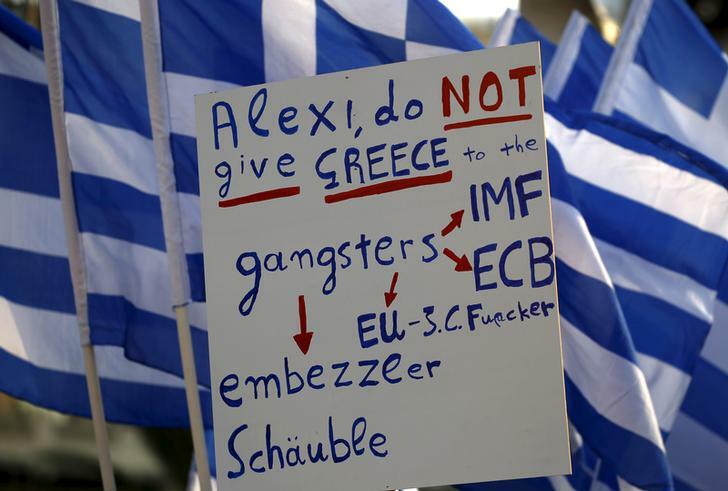 Protesters hold a banner in front of the parliament during a pro-government rally calling on Greece's European and International Monetary creditors to soften their stance in the cash-for-reforms talks in Athens, June 17, 2015. The Greek government presented new budget proposals to its creditors on June 22. European Council President Donald Tusk, who chaired an emergency summit of leaders of the 19-nation currency bloc, called the proposals “a positive step forward”. He said the aim was to have the Eurogroup finance ministers approve a cash-for-reform package on the evening of June 23 and put it to euro zone leaders for final endorsement the following morning. “I am convinced that we will come to a final agreement in the course of this week,” European Commission President Jean-Claude Juncker told a late-night news conference. Jeroen Dijsselbloem, chairman of the euro zone finance ministers, known as the Eurogroup, described the new Greek document as comprehensive and “a basis to really restart the talks”. The Greek proposals included willingness to raise taxes and welfare charges and introduce steps to curtail early retirement, but not the nominal pension and wage cuts first sought by lenders. Leftist Prime Minister Alexis Tsiaris, elected in January on a promise to end austerity measures, also appeared to have avoided promising to raise value added tax on electricity or loosening job protection laws. “We are seeking a comprehensive and viable solution that will be followed by a strong growth package and at the same time render the Greek economy viable,” Tsipras told reporters. The government must repay the IMF 1.6 billion euros by June 30 or be declared in default.